Peter Yagmoor was one of Collingwood's best in its loss to Sandringham in the Elimination Final loss. Photo: Shane Barrie. Collingwood's VFL season came to an end with a 26-point loss to Sandringham in the First Elimination Final at Victoria Park. On a beautiful Melbourne afternoon, the Magpies began well, leading at quarter time, but fell away in the second quarter, when they conceded five goals to nil. Sandringham’s ability to punish Collingwood’s turnovers took its toll, as did its physicality around the ball in a match that had its share of spot fires, particularly when the two sides clashed after the half time siren. Recap collingwoodfc.com.au's play-by-play coverage of Saturday's final. The loss marks the second time in as many years that the Magpies have ended their season in an Elimination Final. “Today’s disappointing because we didn’t play as well as we’ve played over the last four or five weeks,” VFL coach Dale Tapping told collingwoodfc.com.au after the match. “There are probably a few reasons for that and you have to give the opposition a fair bit of credit. “We really couldn’t get any momentum going and to kick 5.15, we just really couldn’t get any flow, and when we did get any momentum we just couldn’t capitalise on it. “It’s a disappointing finish. It’s a reflection of a year’s work in a way and not to progress is disappointing for the whole group, really. Unfortunately that’s the way it goes. “We’ve just got to take the good out of it, if we look at the whole year. Collingwood’s line up was unique for a team running out for an Elimination Final. View the player profiles and jumper numbers for all 30 players on Collingwood's 2014 VFL list. For a start, it featured a debutant, 20-year-old key defender Chris Gleeson, and three players who played their first VFL match just eight days earlier. Injuries decimated both the AFL and VFL teams in the run to September, but the inexperienced Magpies could leave Victoria Park with their heads held high. Tapping explained the situation and the assistance the team’s Development List provided in its hour of need. “We had five players all up from our Development List,” he said. “We had three first gamers last week from our Development program, plus Chris Gleeson today. “The Development List is set up like an AFL rookie type of program, and it’s something that Luke Gatti (VFL General Manager) and myself created last year. “That has enabled us to have the boys train and get educated with us in preparation. “It’s like a recruiting list at the same time, you train them up and they get opportunities the next year. “Cal Matheson was part of our Development List last year and he has come in and we probably missed him today, the little fella. He’s played the last eight games for us and has been really good. He hurt his shoulder last Friday night. “With a few of the injuries and the circumstances over the last couple of weeks we’ve had to seek approval to draw upon our Development List. “They’ve been around the place, there are relationships in place with the coaches and the players and the transition in has been relatively smooth. “The thing is that when you come in and play your first game in a final, that’s a fairly big exposure of experience. “The boys will take some real good way from it and it will whet their appetite going forward, hopefully, if they want to improve and get a good look at what it looks like. Saturday’s loss marked the beginning of several careers, but also the ending of Quinten Lynch’s time in the AFL. 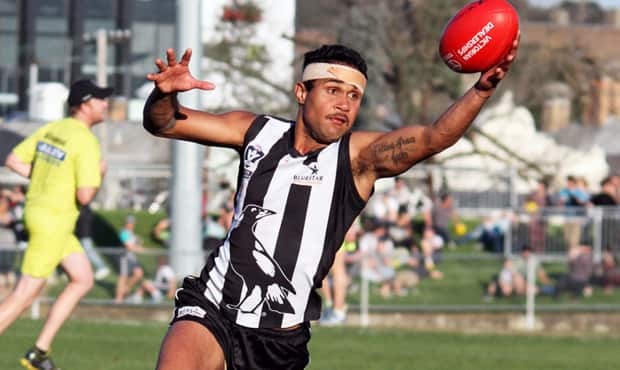 The former Eagle, who spent the last two years at Collingwood, managed just 18 senior games after suffering a series of injuries, but his work ethic and team-first approach has left a lasting impression on his AFL and VFL teammates. “Lynchy’s been outstanding for us,” Tapping said. “He broke his leg in round four and I probably didn’t think he’d come back and play, personally. I’m glad to be proven wrong. “He’s set such a wonderful example. Externally a lot of people are probably going to look at the 18 (AFL) games and think ‘he wasn’t worth it’, but I can certainly say he has been. “He’s been a great performer with us in terms of his influence on how to train and how to prepare. The guys really enjoyed his company and for him to come back from that severe injury early in the season and perform as he has over the last four or five weeks has been really good.